We rolled out a cool new feature for our active trials and current customers. 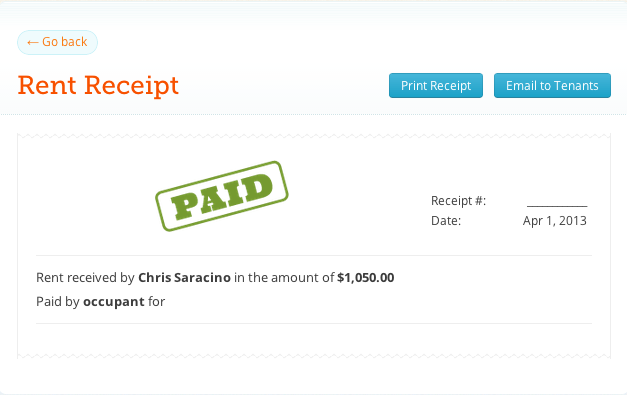 It’s a rent receipts feature in Renting Well, that makes supplying receipts for rent received from tenants a *snap*. As you may know, come income tax time, you may get a lot of requests from tenant for receipts. You’re obligated to provide a receipt if a tenant asks for one. All that to say, adding this feature was something we were keen on getting to post launch, and is part of a series of additions we’re going to be moving forward with over the next few months. Firing off a rent receipt is dead simple. Next to each revenue item marked “rent”, you’ll notice a small button labelled “receipt”. Click that – and it’ll give you two options to either email the receipt directly to the tenant associated with the rent payment, or to print the rent receipt if you wish. Questions? Comments? Share with us. We’d love to hear your feedback. Great product! I’m a relatively new landlord (& live in Ottawa too :)) and am looking for a product just like this. The feature I was looking for is the option to email a rent receipt directly to a tenant from the software. I have tried this feature in renting well but it doesn’t autopopulate the receipt number or have a link to the tenant. Will these 2 features be included in one of the updates? If so, when might that be? Alternatively, maybe I’m doing something wrong? !